Game Recap: The Colts flounder to the Steelheads. (w/ video highlights) #OHL - Very Barrie Colts | A website covering the Barrie Colts of the OHL. 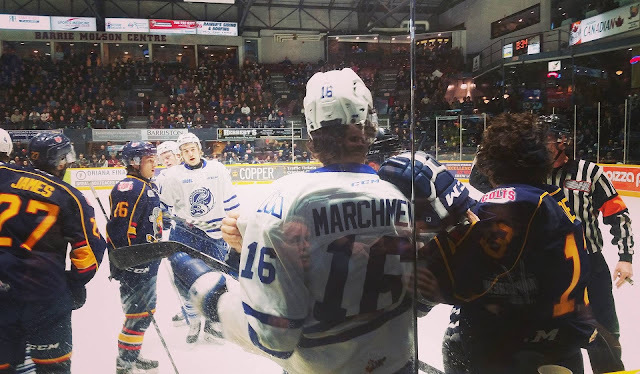 Last night the Barrie Colts dropped what almost felt like a sure win in Game 2 of the OHL quarter finals to the Mississauga Steelheads by a score of 6-3. Barrie came out strong in the first period. It would be Justin Scott who would get the first goal of the night just before the five minute mark. Both Carrick and Andrew Mangiapane were credited with assists. For the most part the period was strong for the Colts generating 16 shots on goal. Blackwood looked sharp early stopping all 11 shots that he faced. Barrie would head into the first intermission with a 1-0 lead. Very similar to the first. Colts came out strong and generated a lot of chances. Really were the dominant team for the majority of the second frame. Mississauga would head to a power play after Sadowy was called for unsportsmanlike conduct. It would be Barrie that would strike late in the penalty kill when Rasmus Andersson would score with 18 seconds remaining in the Trout power play. About 7 minutes later the Colts would show off their special games again on the power play. LeBlanc took a holding penalty and more than 1:30 into the man advantage Anthony Stefano would score his first of the post season. An assist went to Greg DiTomaso. Heated game at this point and it peaked when Everett Clark and Keigan Goetz decided to drop the gloves. Very chippy game with 11 minor penalties already called at this point of the game. The period would end with the Colts leading 3-0. Colts were out shooting the Steelheads 32-20 after two periods. Everyone was pretty excited! Colts headed into the next frame on top of the world! Pretty tough to drop a lead with the momentum they had going at this point. Only issue is the Colts forgot to show up in the 3rd. Mississauga would score 6 goals in the final 13 minutes. Here is a look at the box score. An absolute mess. Defensively the team just checked out. Nobody was covering their man in front of the net, nobody was playing with the same edge they did in the first two periods and they just watched the Trout make passes right in front of Blackwood. If you look at the goal chart, all 6 goals were scored from the exact same location. Blackwood wasn't incredible here but the team left him out to dry. HC Dale Hawerchuk really needs to structure a better way to sit on a lead if that is his game plan because it really looked that way last night. Also, if that is his game plan, he needs a new one. Barrie just sat back and allowed Mississauga to get 16 shots off and control the play in their end in the final frame. Barrie will need to have to find a way to play a complete 60 minutes if they don't want to let this series get away from them. Here is some video highlights from the game from our friends at DRL Productions! Game 3 is set for tonight in Mississauga. Puck Drop is scheduled for 7:05.